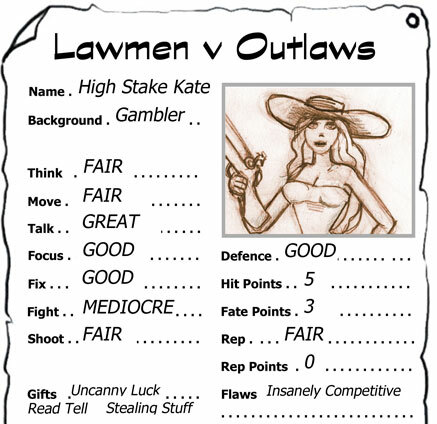 Lawmen v Outlaws is a simple Western themed roleplaying game about… erm… lawmen and outlaws. The game uses a variant of the Fudge roleplaying system, designed to be easy to learn and fast in play. New rules including the Minion Machine and Complex Tests will help you create interesting and varied challenges with little or no advance preparation. Adventure seeds for both lawmen and outlaws are also included. These things combined make Lawmen V Outlaw ideally suited for pick-up games. 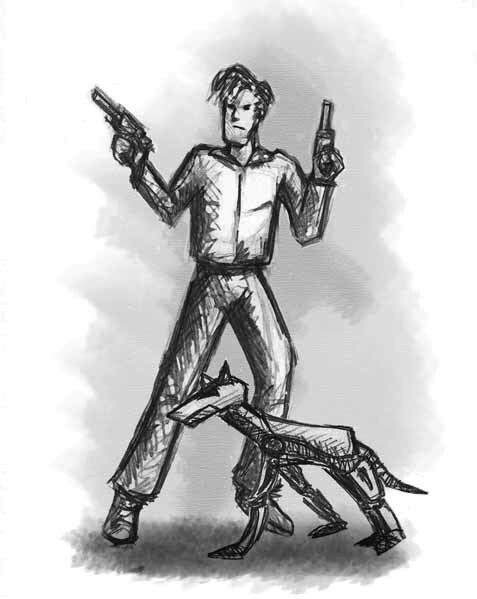 The Ballad of Bad Bob McKlusky is a free adventure for Bounty Hunters of the Atomic Wastelands. The Bounty Hunters are on the trail of a notorious cattle rustler but in the Atomic Wastelands things are never quite that simple. The adventure is presented in a non-linear fashion as a collection of Clues, Locations and Complications for the GM to assemble as he or she sees fit. > Download the Ballad of Bad Bob McKlusky today! A collection of free games and adventures to download from Polar Blues Press. More product specific information can be found at https://ukrpdc.wordpress.com/category/polar-blues-press/. Cyberblues City is just about finished. All I am doing now is just tweaking a bit the wording here and there, focusing on the tone. The artwork and playtesting is all behind me now and I am really quite excited and proud. I had a vision of what Cyberblues City should be like long before it even had a title. I’m happy to say 8 months later I have stuck with that vision. I wanted the game to harness all the best features of Bounty Hunters of the Atomic Wasteland but be simpler, leaving out those things that were still a little bit confusing or seldom used in practice. I was initially aiming for about 12 pages. It turned out to be more like 36. That is still just ⅓ of BHAW’s page count. More to the point all of what is contained in those 36 pages does get used in play. I was aiming for a very specific tone in the writing, laconic but with humour. The writing assumes this is not the reader’s first rodeo which helps maintain a brisk writing style and makes it a better reference book. That’s the bit I still working on, but that tone is there. I wanted to write a cyperpunk game that didn’t take itself too seriously and wasn’t too wrapped up in 80s aesthetics. Hence cyberpunk became cyberblues. The increase in inequality and roll back on civil liberties we’ve witnessed in the last decade were clearly an inspiration but I didn’t want to get all preachy about it. And finally I wanted to do something different with the artwork. I’m no artists. The cartoon characters of Bounty Hunters of the Atomic Wastelands are pretty much all I know how to do. So doing “different” was always going to be a challenge. But I quite pleased with the results. I think they fit the text very well. There are some examples on this page. So all in all, I’ve met my initial goals, it plays really well and some of the jokes are very funny. All things being equal I think the pdf should be ready for release in the next few weeks. Afterwards I’ll probably and get a few copies printed for private use and to give to my play testers. As with BHAW it will be a free download. As far as I am concerned work is work, hobbies are hobbies and mixing the two would just mess with my head. I’ve been working on a new roleplaying game I call Cyberblues City. Cyberblues is sort of like cyberpunk, only more mellow. 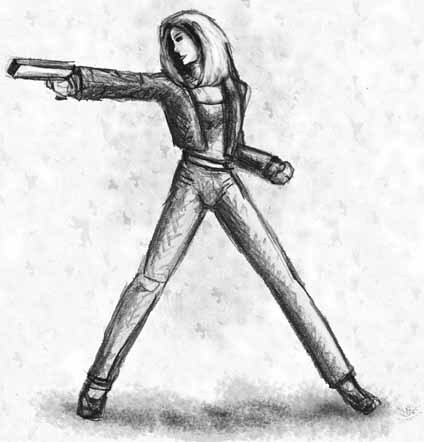 I got me the notion a short while back of writing a cyberpunk conversion of Bounty Hunters of the Atomic Wastelands (BHAW). I figured it would just be a simple lift and shift, turned out it required a substantial rethink. One concept that really grabbed me while thinking about this project the idea of terseness. There is something beautifully immediate about a terse set of rules, provided of course you are already a seasoned gamer. I wanted to keep Cyberblues City terse as a style choice (terse is the right tone for the Cyberblues) but also as a design goal. To achieve this terseness all rules that were either confusing until you’ve got used to them, require a lot of explaining or read well but didn’t get much use in actual play had to be removed. The result ended up looking a lot more like Fudge than Fate. But I was OK with that. I had not written anything for Fudge since Mutant Bikers of the Atomic Wastelands. There scores of folk writing Fate games these days, maybe it was time to go back to my roots. The first draft of Cyberblues City is currently in play test phase. So far I like what I am seeing. It’s got some new dice mechanics I am very pleased with, I might even blog about them. I haven’t started with illustrations yet but I have some ideas and try something different this time. As with BHAW when it’s all done, it will be released as a free pdf so keep checking here for updates! Last Saturday I managed to make it to the London Indiemeet for the first time in 6 months and got to run a playtest of the Alternative Histories idea for a follow up to Intrepid. 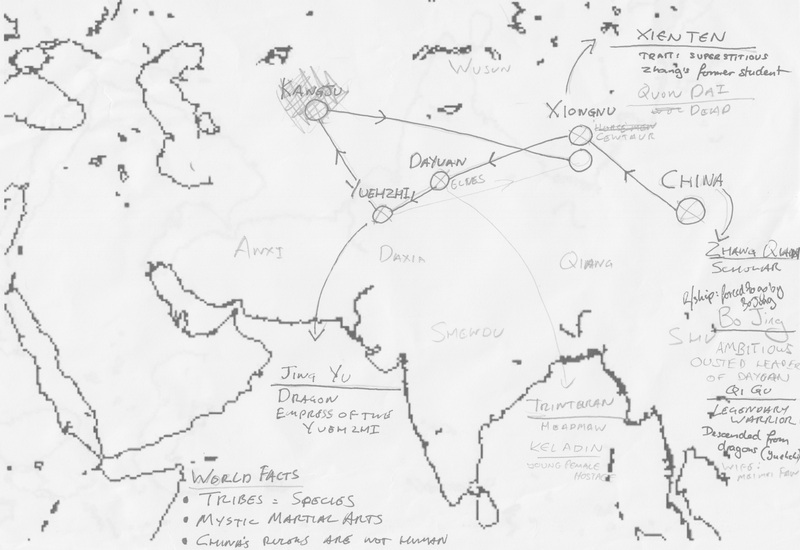 Upon which the players each added a function detail about the world (see World Facts on the map). Only one of the three facts really came into play in any significant way but I don’t think that hurt the game at all, they all helped set the tone. We then also created 5 characters, giving them a name, trait and relationship… 3 from Zhang Qian’s expedition, one from the Xiongnu and the last form the Yuezhi. While creating these characters in advance felt important, a promise of what’s to come, the actual content (name/trait/relationship) felt a little weak, especially when I played Marquis of Ferrara in the next slot which comes with lots of excellent characters you can still make your own. Something needs to be done here. The game then proceeded to play out 3 scenes at each stage of the journey (as you can see from the map I removed Kangju to improve the pacing) in a fairly standard pick a character, frame, free narration kind of way. Framing scenes did a lot to flesh out the locations on the journey, which was good and I hope to encourage. Each scene ended when all players had put a card in the middle of the table, pick one at random to get a good/bad ending for the framing character. Kind of like a cross between Intrepid’s crossroads and Fiasco’s black/white dice. It was serviceable and introduced some reasonable twists into the story. I don’t know yet if I want to to be more or less. All in all we got a decent story with some unexpected twists and interesting characters. The world building was a little shallow and I think the character setup wasn’t as robust as it could have been so I’ll need to work on those before the next playtest. I’ll probably stick with Zhang to see how different two playthroughs of the same scenario can be, but after that I think Napoleon’s march on Russia will be next. I may have now played a game of it but it still doesn’t have a name (unsurprisingly).